suzuki gsx-r motogp test team | Throttle Life! The Suzuki GSX-R has always been about race-bred performance for the street. 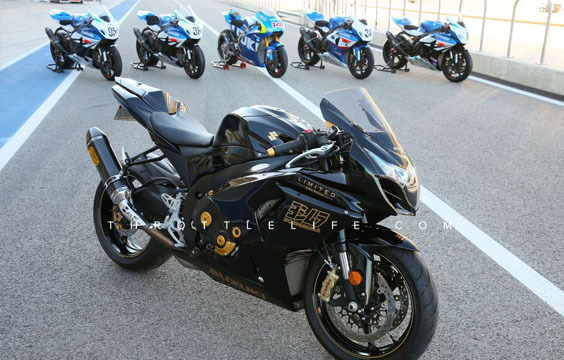 With its recent test at the Circuit Of The Americas (COTA) in Austin, Texas, Suzuki reinforced that message by showcasing the 2014 Suzuki GSX-R1000 sportbikes (including the above pictured Yoshimura-Limited-Edition model) alongside the Suzuki GSX-R race bikes that compete on national and international circuits. The entire Yoshimura Suzuki Factory Racing team â€“ including racers Martin Cardenas, Roger Hayden, and Chris Clark – attended this test to ride their GSX-R1000s equipped for AMA Pro Superbike competition. Also on the track were Suzuki MotoGP test riders Randy DePuniet, Nobuatsu Aoki, and Austin resident and special guest test rider Kevin Schwantz.